Ocean ecosystems are increasingly stressed by human-induced changes of their physical, chemical and biological environment. 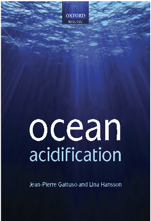 Among these changes, warming, acidification, deoxygenation and changes in primary productivity by marine phytoplankton can be considered as four of the major stressors of open ocean ecosystems. Due to rising atmospheric CO2 in the coming decades, these changes will be amplified. Here, we use the most recent simulations performed in the framework of the Coupled Model Intercomparison Project 5 to assess how these stressors may evolve over the course of the 21st century. The 10 Earth system models used here project similar trends in ocean warming, acidification, deoxygenation and reduced primary productivity for each of the IPCC’s representative concentration pathways (RCPs) over the 21st century. For the “business-as-usual” scenario RCP8.5, the model-mean changes in the 2090s (compared to the 1990s) for sea surface temperature, sea surface pH, global O2 content and integrated primary productivity amount to &plus;2.73 (±0.72) °C, −0.33 (±0.003) pH unit, −3.45 (±0.44)% and −8.6 (±7.9)%, respectively. For the high mitigation scenario RCP2.6, corresponding changes are +0.71 (±0.45) °C, −0.07 (±0.001) pH unit, −1.81 (±0.31)% and −2.0 (±4.1)%, respectively, illustrating the effectiveness of extreme mitigation strategies. Although these stressors operate globally, they display distinct regional patterns and thus do not change coincidentally. Large decreases in O2 and in pH are simulated in global ocean intermediate and mode waters, whereas large reductions in primary production are simulated in the tropics and in the North Atlantic. Although temperature and pH projections are robust across models, the same does not hold for projections of subsurface O2 concentrations in the tropics and global and regional changes in net primary productivity. These high uncertainties in projections of primary productivity and subsurface oxygen prompt us to continue inter-model comparisons to understand these model differences, while calling for caution when using the CMIP5 models to force regional impact models. Most future projections forecast significant and ongoing climate change during the 21st century, but with the severity of impacts dependent on efforts to restrain or reorganise human activity to limit carbon dioxide (CO2) emissions. A major sink for atmospheric CO2, and a key source of biological resources, the World Ocean is widely anticipated to undergo profound physical and – via ocean acidification – chemical changes as direct and indirect results of these emissions. Given strong biophysical coupling, the marine biota is also expected to experience strong changes in response to this anthropogenic forcing. 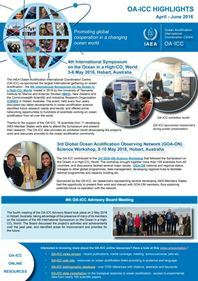 Here we examine the large-scale response of ocean biogeochemistry to climate and acidification impacts during the 21st century for Representative Concentration Pathways (RCPs) 2.6 and 8.5 using an intermediate complexity global ecosystem model, MEDUSA-2.0. The primary impact of future change lies in stratification-led declines in the availability of key nutrients in surface waters, which in turn leads to a global decrease (1990s vs. 2090s) in ocean productivity (−6.3%). This impact has knock-on consequences for the abundance of the low trophic level biogeochemical actors modelled by MEDUSA-2.0 (−5.8%), and these would be expected to similarly impact higher trophic level elements such as fisheries. Related impacts are found in the flux of organic material to seafloor communities (−40.7% at 1000 m), and in the volume of ocean suboxic zones (+12.5%). A sensitivity analysis removing an acidification feedback on calcification finds that change in this process significantly impacts benthic communities, suggesting that a~better understanding of the OA-sensitivity of calcifying organisms, and their role in ballasting sinking organic carbon, may significantly improve forecasting of these ecosystems. For all processes, there is geographical variability in change – for instance, productivity declines −21% in the Atlantic and increases +59% in the Arctic – and changes are much more pronounced under RCP 8.5 than the RCP 2.6 scenario. Rising atmospheric CO2 concentrations are placing spatially divergent stresses on the world’s tropical coral reefs through increasing ocean surface temperatures and ocean acidification. We show how these two stressors combine to alter the global habitat suitability for shallow coral reef ecosystems, using statistical Bioclimatic Envelope Models rather than basing projections on any a priori assumptions of physiological tolerances or fixed thresholds. We apply two different modeling approaches (Maximum Entropy and Boosted Regression Trees) with two levels of complexity (one of them a simplified and reduced environmental variable version of the other). Our models project a marked temperature-driven decline in habitat suitability for many of the most significant and bio-diverse tropical coral regions, particularly in the central Indo-Pacific. This is accompanied by a temperature-driven poleward range expansion of favorable conditions accelerating up to 40-70 km per decade by 2070. We find that ocean acidification is less influential for determining future habitat suitability than warming, and its deleterious effects are centered evenly in both hemispheres between 5-20° latitude. Contrary to expectations, the combined impact of ocean surface temperature rise and acidification leads to little, if any, degradation in future habitat suitability across much of the Atlantic and areas currently considered ‘marginal’ for tropical corals, such as the eastern Equatorial Pacific. These results are consistent with fossil evidence of range expansions during past warm periods. In addition, the simplified models are particularly sensitive to short-term temperature variations and their projections correlate well with reported locations of bleaching events. Our approach offers new insights into the relative impact of two global environmental pressures associated with rising atmospheric CO2 on potential future habitats, but greater understanding of past and current controls on coral reef ecosystems is essential to their conservation and management under a changing climate. In ocean biogeochemical models pelagic CaCO3 dissolution is usually calculated as R = k * Sn, where k is the dissolution rate constant transforming S, the degree of (under-) saturation of seawater with respect to CaCO3, into a time dependent rate R, and n is the reaction rate order. Generally, there are two ways to define the saturation state of seawater with respect to CaCO3: (1) Δ[CO32−], which reflects the difference between the in-situ carbonate ion concentration and the saturation concentration, and (2) Ω, which is approximated by the ratio of in-situ carbonate ion concentration over the saturation concentration. Although describing the same phenomenon, the deviation from equilibrium, both expressions are not equally applicable for the calculation of CaCO3 dissolution in the ocean across pressure gradients, as they differ in their sensitivity to ocean acidification (change of [CO32−]) over depth. In the present study we use a marine biogeochemical model to test the sensitivity of pelagic CaCO3 dissolution to ocean acidification (1–4 × CO2 + stabilization), exploring the possible parameter space for CaCO3 dissolution kinetics as given in the literature. We find that at the millennial time scale there is a wide range of CaCO3 particle flux attenuation into the ocean interior (e.g. a reduction of −55 to −85% at 1000 m depth), which means that there are significant differences in the impact on particle ballasting, depending on the kinetic expression applied. Climate targets are designed to inform policies that would limit the magnitude and impacts of climate change caused by anthropogenic emissions of greenhouse gases and other substances. The target that is currently recognized by most world governments1 places a limit of two degrees Celsius on the global mean warming since preindustrial times. This would require large sustained reductions in carbon dioxide emissions during the twenty-first century and beyond2, 3, 4. Such a global temperature target, however, is not sufficient to control many other quantities, such as transient sea level rise5, ocean acidification6, 7 and net primary production on land8, 9. Here, using an Earth system model of intermediate complexity (EMIC) in an observation-informed Bayesian approach, we show that allowable carbon emissions are substantially reduced when multiple climate targets are set. We take into account uncertainties in physical and carbon cycle model parameters, radiative efficiencies10, climate sensitivity11 and carbon cycle feedbacks12, 13 along with a large set of observational constraints. Within this framework, we explore a broad range of economically feasible greenhouse gas scenarios from the integrated assessment community14, 15, 16, 17 to determine the likelihood of meeting a combination of specific global and regional targets under various assumptions. For any given likelihood of meeting a set of such targets, the allowable cumulative emissions are greatly reduced from those inferred from the temperature target alone. Therefore, temperature targets alone are unable to comprehensively limit the risks from anthropogenic emissions. More than 380 Pg of carbon have been released by human activities from fossil fuel combustion and cement manufacturing since the beginning of the Industrial Revolution. This carbon release has caused atmospheric CO2 levels to increase by ~100 ppmv compared to the highest interglacial value of the last ~800,000 years. Net uptake of carbon by the oceans has caused the surface ocean pH to drop by ~0.1 pH units. Evaluating carbon sequestration options is now timely. We use the carbon-cycle model LOSCAR to evaluate the effects of artificially enhancing ocean alkalinity from year 2020 to year 2400 on ocean pH and atmospheric pCO2. Ten different carbon emission scenarios with scaled alkalinity input are simulated. Results show that for ocean pH to be maintained above 8.0, on the order of 2–10 × 1014 moles of alkalinity/year for C emissions of 1500–5000 Pg C, respectively, is required. Atmospheric pCO2 remains high (500–600 ppmv) in nine of the carbon emission scenarios. Ocean alkalization, if ever implemented at such a large scale, could allow ocean pH to be stabilized but pCO2 would not return to pre-industrial levels. Cost estimates of the ocean alkalization operation, using quicklime (CaO) was estimated to range from 0.5 to 2.8 $US trillion/year, depending on the target pH selected to avoid damage to marine organisms and ecosystems. For comparison, this cost is ~0.8% and ~4.6% of the 2011 global Gross Domestic Product for total anthropogenic carbon emissions of 1500 and 5000 Pg C, respectively. The cost of 1 ton of CO2 sequestered ranges from 103 to 144 $US for total emissions of 1500–5000 Pg C, respectively. Producing large amounts of quicklime (without carbon capture and storage) would cause substantial additional CO2 release. This reduces the fossil fuel emissions allowed to maintain pH above 8.0 by a factor of 1.3–2.5 (for total emissions of 1000 and 5000 Pg C, respectively).